While a few areas of the country are actually in drought conditions, much of the nation has experienced violent weather in these summer months and literally millions of people have had a deluge (rain or flood) hit their community! These storms have resulted in water damage impacting hundreds of thousands of homes. If that water damage is not remediated very quickly and professionally, the inevitable result will be mold. Molds are a very large group of fungi. Mold spores are found everywhere throughout the world. However, when molds are found indoors, they can damage or destroy the structure, and they pose serious health concerns to persons living in that environment, especially these individuals who are highly susceptible: the very young or the very old, persons with pre-existing respiratory ailments such as asthma or lung disease, persons who are already ill or are treating a chronic illness, etc. 2: An agreeable temperature range between 68є and 86є F, which is typical of most occupied buildings. 3: Sufficient moisture that can come from a plumbing leak, water damage from a storm (or even high humidity). In most homes, the conditions are nearly ideal for mold to grow – there is only one requirement item that is missing – water. If you now add water from a storm, or other source, and you do not remediate quickly and correctly, then mold WILL grow. Following any water damage event, the very best way to ensure that mold will not begin to grow is to contact our restoration professionals to remediate the loss, or even to do an inspection to confirm that there are no lingering (mold-causing) problems in the home. Our restoration professionals have a wide variety of professional tools and meters to evaluate a home quickly and thoroughly. If there are problem areas then we will be able to develop a plan for complete remediation and restoration of your property. If, despite all of your best efforts, you suspect that there is mold in your home, it is important to know what to do. In many cases, the very first indication that mold is growing somewhere in the home is odor; truly, your nose knows! The distinctive musty/moldy odor (that everyone recognizes) is the result of Microbial Volatile Organic Compounds, the gases that are released into the air whenever mold is growing and digesting food sources. When you notice the moldy smell, then, somewhere, mold is growing. A very little amount of mold can give off a lot of odor. It is important to find the mold and to properly remediate the problem, and to be sure the underlying water problem is resolved/fixed. Again, a restoration professional is a great resource to assist in the evaluation and the remedy. Often, people will attempt to remove small amounts of mold themselves. A common example is when mold (often called mildew) is growing on the grout of bathroom tile. 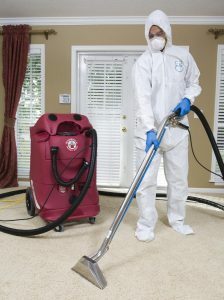 Commercial cleaners designed for mold and mildew removal are usually successful in such cases. Obviously, the user should follow label directions, wear gloves and eye protection, and ensure there is adequate ventilation to avoid the buildup of unpleasant vapors. It is important to remember that such cleaners consist mostly of water (90% or more), and that moisture is the leading cause of mold growth. It is therefore essential to thoroughly dry the area after cleaning. Even a small fan is can provide huge assistance in helping to dry materials. If it is left moist, the mold/mildew will usually reappear in a very short time. If a significant amount of mold in basement homes is present, or if you are simply not comfortable in dealing with the overall situation, then our professional remediation company, PuroClean, should be contacted to assist with evaluation and remediation. We may establish a containment area around the materials to prevent the spread of mold and spores to other unaffected parts of the building. Our employees will also wear necessary Personal Protective Equipment such as gloves, impermeable coveralls, face shields, respirators, etc. Care should be taken to make sure the remediation is done properly, by a professional. Otherwise it may be of little or no benefit and could possibly make the situation worse by spreading the contamination. And, finally, it is essential that the underlying water problem that allowed the mold to grow in the first place, is fixed. If that is not done, then mold will almost certainly reappear. 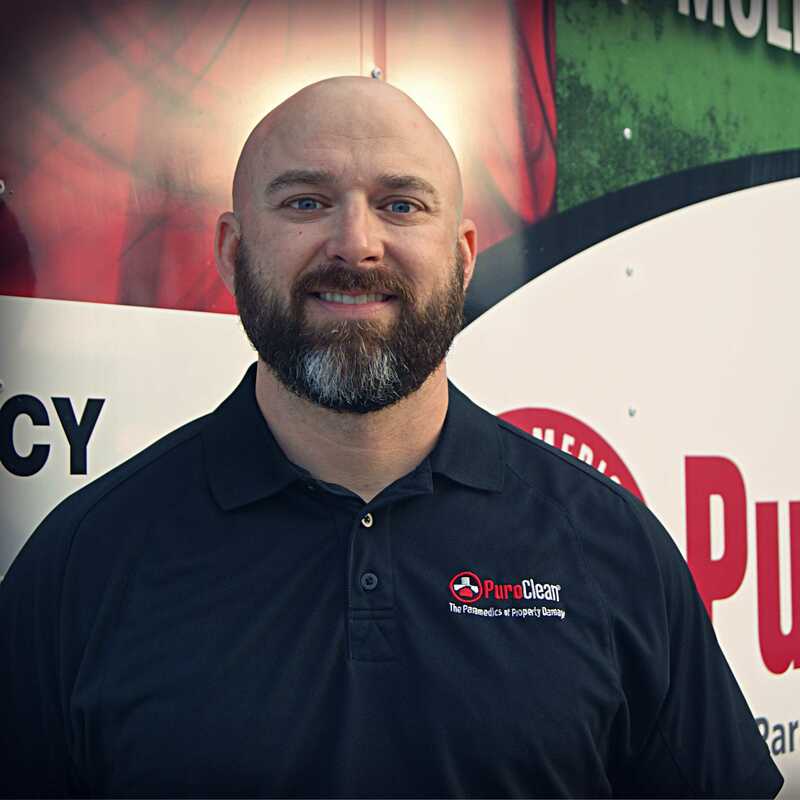 Regardless of the circumstances – damage from storms or floods, mold assessment and remediation, or damage from fire or smoke, call our local PuroClean office. We are the Paramedics of Property Damage™. Our professionals are standing by and will mitigate the loss to prevent further damage and will then provide restoration services to return the property to a pre-loss condition as quickly as possible. As the Paramedics of Property Damage, we have professional, well-trained technicians who provide the latest state-of-the-science services to all property damaged from water, fire/smoke, mold, and other disasters.